Last weekend we grilled out some skirt steak. I used a new Lawry's 30 minute mariande (Santa Fe Chili Marinade with Lime and Garlic) and wanted a new side dish to go with it. Chicken Legs requested potato casserole, so I came up with this Southwestern Potato Casserole. Potatoes, sour cream, Velveeta and Rotel - what's not to like? The potatoes were so creamy and had a little kick from the Rotel. You can use mild Rotel if you are worried about the heat. The steak marinade was great - I highly recommend it - and the potatoes were absolutely delicious! I divided the uncooked potoatoes into three 8x8 foil pans and froze them for later. We have already used one pan for dinner this week. Combine sour cream, cream of chicken soup, Rotel tomatoes, and cheese in a large bowl. 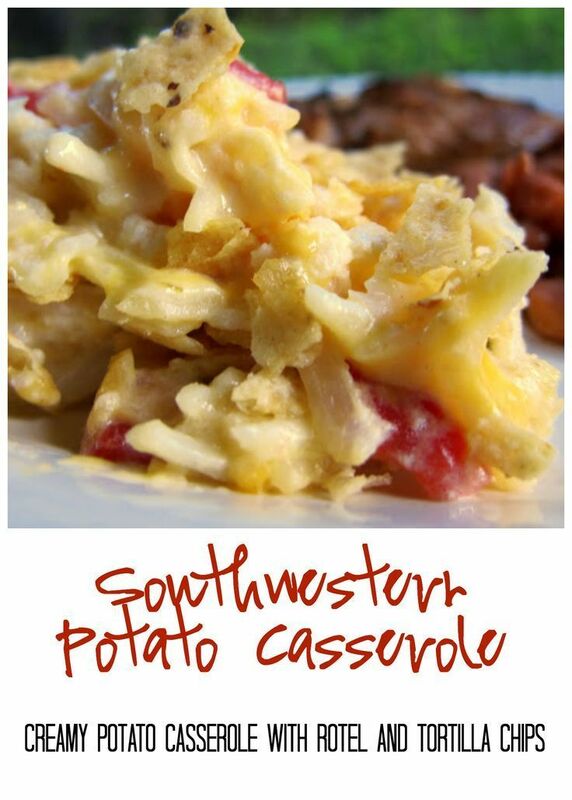 Fold in the hash browns and pour into a 3-quart casserole that has been sprayed with nonstick cooking spray. Top casserole with crushed tortilla chips and drop dollops of butter on top. Bake for 45 minutes. This sounds great! I have to try it! All of your recipes sound great! I have been getting a whole new lease on dinner with your great additions. I've been curious a few times...what is Rotel? Creamy and spicy, I like it. It's like rotel dip in potato casserole. How do you freeze for later? Oh this was sooo good! Thanks for posting it. Thanks for a great recipe. Made it yesterday and people were going back for seconds & thirds. I think next time I'll just top with panko, tho. I feel like this is missing steps. To clarify, do you cook the frozen hash browns first or mix frozen?